The new warden in charge of Pul-i-Charkhi, Afghanistan's largest prison, refuses to stop subjecting female visitors to invasive and humiliating vaginal searches unless someone gives him an X-ray machine to play with. Human Rights Watch released a statement today asking the Afghan government to immediately take action, but it's unlikely that the warden, who pooh-poohed allegations that the searches are a human rights offense, will care. According to HRW, the cavity searches are conducted by untrained female prison guards in unhygienic conditions on every female visitor to the prison. Male visitors, on the other hand, are simply patted down. 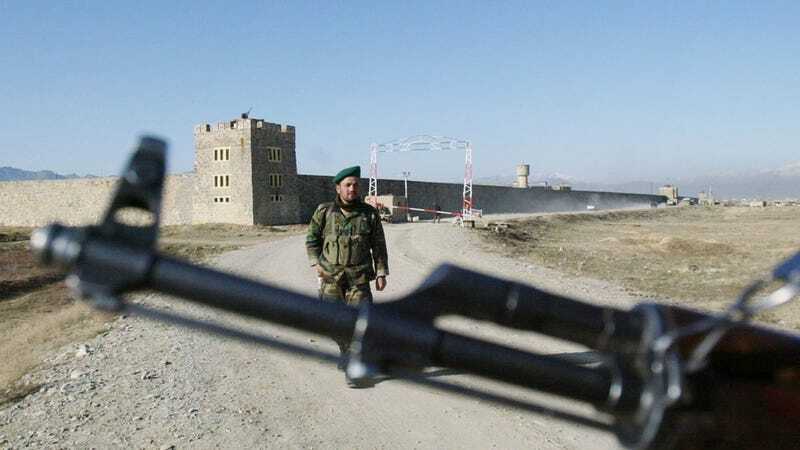 The searches began earlier this year, after the transfer of Afghan prisons from the Ministry of Justice to the Ministry of Interior, which supervises the police. Critics worried that the transfer would give the country's corrupt, pro-torture police force too much authority over interrogations — and apparently it's allowed them jurisdiction over women's bodies, too. New warden General Khan Mohammad Khan, who comes from the police force and has no experience in prison management, told the Times that the searches would continue because "stopping somebody hiding narcotics or mobile phone or banned items, that's not a violation of their rights." He added that the searches were only conducted on "suspicious" women and that male smugglers could be searched, too, but other prison officials say that's not true. "We have been strictly ordered to search genital areas of all the women who are visiting the prisoners," one guard said. Khan refuses to try out less invasive search methods, such as observing visits or searching prisoners after their visitors leave. In fact, the male prisoners aren't searched at all — it's just their lady friends who get the honor. Hopefully HRW's decree will convince Khan to rethink things, but he hasn't been swayed by his own country's head of the civilian prison system, who asked him to end the searches, or by the U.S., who cut off funding to the prison until the searches end. The U.S. has spent millions on the prison's infrastructure since 2009, but says it has no plans to buy Khan the X-ray machine he's demanded. What about buying Khan his own personal cavity search instead? Actually, we'll give it to him free of charge.